Today, whether Maxin' & relaxin, grillin & chillin or in a struggle for your family, marriage, or life never forget, you have a FATHER in heaven, a friend in Hampton & your prayers have power! Mission SOS is led by Johannes & Maria Armritzer of Sweden. A graduate of Teen Challenge over 25 years ago, Johannes was a violent young man and came into TC with an 18 inch knife that he wanted to tuck under his pillow as he slept. He shared with me, "They took my knife and gave me a Bible. They told me that was all the sword I needed, and Jesus Christ changed my life." He has planted over 800 churches, partnered in outreach by Reinhard Bohnke and Steve Hill worldwide and works with Bishop Barnabas Mtokambali in Africa. 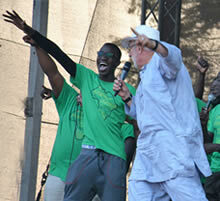 He has embarked on a mission to host major festivals in every African Capitol City on the Continent. 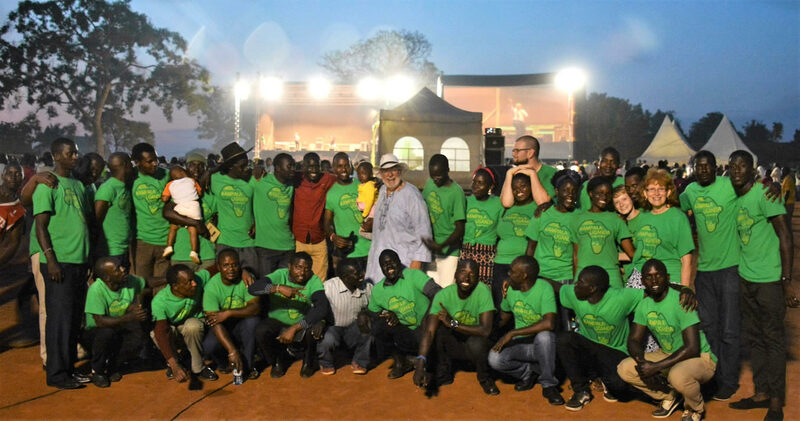 It was a powerful week of ministry as tens of thousands packed into the Kaso Grounds and soccer field in Northwest Kampala. 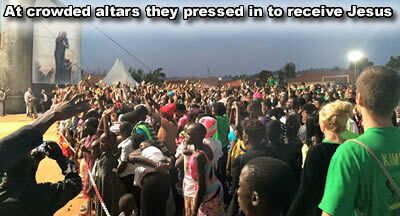 Surrounded by slums, wearing poverty and addiction, over 20,000 made first time confessions of faith in Jesus Christ. On the final night of the outreach, 7000 were filled with the Holy Spirit and received a prayer language as miracles happened every night. The Teen Challenge team did a great job as the combined groups from Kampala and Nairobi, Kenya assembled as a mass choir to minister in music. 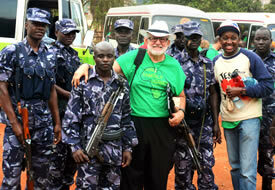 MISSION SOS in Kampala, Uganda. On the street, Teen Challenge Uganda was able to open the doors to minister to women stricken by poverty, victims of human trafficking and prostitutes in one of the slums. 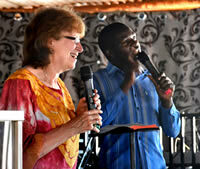 Cathy ministered a powerful word and God really moved in a special way. It was wonderful to see TC students and leaders join with almost 300 missionaries from around the world, from Europe, Asia, Africa, United States, Latin America and Canada. Teen Challenge staff, students and volunteers were given amazing opportunities to minister at the Festival. 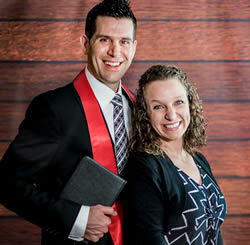 They served as translators at the altar, and in deliverance and healing tents. Students were truly blessed. It was exciting to see their confidence grow as they saw the miracles and God continued to use them over the course of the week They also served in music, shared testimony and as translators for inner-city outreach meetings each morning as the “advance meetings” took place on the street. 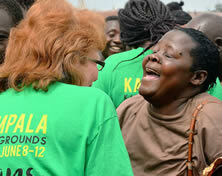 The Kenya team traveled 20+ hours by bus to join us in Kampala. Praise God! Thank you to all of you that made it possible, not only for Cathy and I to attend, but to sponsor students from Teen Challenge centers across Africa. The students saw miracles and the boldness of Teen Challenge graduates like Johannes, as well as the vision that he imparts to reach the lost. This is clearly fulfilling a significant need in the discipleship process for these young men. God is raising up end-time warriors. I am so glad God loved us first - and loved us best. It is amazing how often I think that “I gave my life to God." But even in that, I need to understand that even the ability give myself to God is a gift not as a matter of works lest any should boast. The decision is mine, but the initiative is God's. The truth is, while I may think I gave my life to God, in the end it is God gave his life to us. Never forget, the initiative, as always, is with God. I think that it is me making the decisions, but while I understand that harnessing my will to HIS promise has dynamic power… It is HE that is truly doing the work. Until I surrender all I have, I cannot truly receive what God has to give. In the beginning God spoke into nothing and made everything.­­ It was not a big bang- not in the beginning- not in my life – no big bang about it! God spoke and the only Big Bang was HIS BIG WORD. The big bang is so foolish. Are we really to believe that there was nothing and then it exploded and now the exploded nothing is something and that “something” evolved into everything?? Come on, man! The words IN THE BEGINING GOD are the most important 4 words in all the Bible. If God did not create the heavens and earth then all the rest of what we read in the Bible is a lie. It’s either the Big Bang or a Big God. Where did the universe, mankind, the animals and all creatures great and small, plants, vegetables---everything come from? I believe that everything that was made was made by Him. When we take that truth and overlay it on our struggles, it points out one of the most important basic truths of life. Our humanity cries out to be seen and recognized. Even when we testify, we want to think, "God saw something good in me, that no one saw, and that is why He called me." The apostle Paul saw better. (Rom 7:8) He recognized that in him no good thing dwells. God saw absolutely nothing in me-but He loved me anyway! I have nothing to offer-that’s not bad news! That is good news! If the God of creation took nothing and made everything, It is important that I recognize that, in the same way, until I recognize that I am nothing, the One that made everything, cannot do anything. And for that reason, according to Revelation chapter 3, He stands at the door and knocks. Today, if you feel like "nothing," do not despair! You are right where God can do his most creative work. The God who created it all can take nothing and make everything. Seven different teams, doing 2 to 3 meetings every morning, carried the gospel right to where people in deepest need lived. Not only did the street outreach give us an opportunity to promote the festival and pass out fliers, but over 3,800 honest seekers, made first-time confessions of Faith in Jesus Christ during the street ministry. 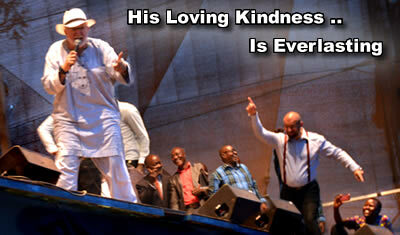 God moved miraculously in healings and deliverance. 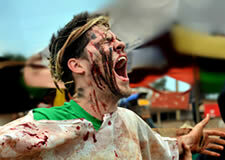 Street drama included a powerful demonstration of the gift of salvation and the power of the Resurrection. 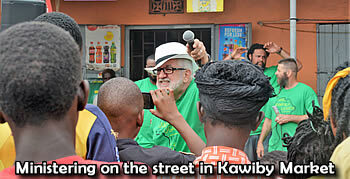 Using street drama, dance, testimony, music and preaching, every meeting included an invitation to meet Christ personally. While Uganda is a very religious country, it was so important to communicate the importance of a personal relationship with Jesus Christ. 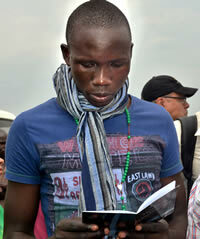 Over 20,000 follow-up books were given to those who made faith commitments to Jesus Christ. 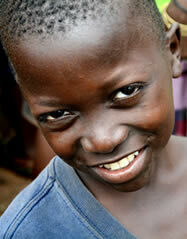 Hostility and suspicion by some of the children melted as the presence of God touched their lives. 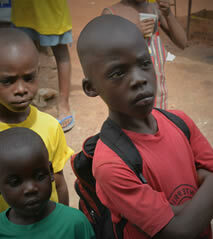 Frowns turned to smiles as we prayed with these street boys. 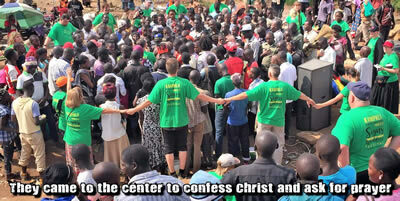 Please pray for us as we assemble our team for the MISSION SOS in Bujumbura, Burundi. Do you speak Kirundy? Why not join us. 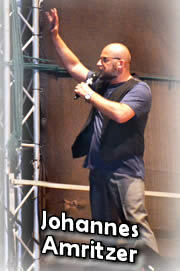 We will again join Johannes Armritzer and MISSION SOS along with over 200 Missionaries from around the world. We are believing God for 20 to 30,000 people for each evening service--80,000 by the final night. PRAY WITH US! JOIN US. Please join with us in prayer as we continue to seek God as we finalize our plans for the 2016 ministry year. We have so many pending invitations India, Lebanon and Russia. Please stand with us in prayer that we will clearly hear the voice of the Lord. Please pray for the thousands that met Jesus Christ in a personal way during the Mission SOS outreach. Pray for those that were supernaturally healed and delivered. The most touching part of the outreach was on the final day, as evangelist Johannes Amritzer turned over the boxes with 20,000 names to the local pastors of the organizing committee and said "Please, my dear brothers, I beg you! Do not let this harvest die on the vine." Stand with us that God will truly touch and impact Uganda through the work that was done in these last 14 days around Kampala. 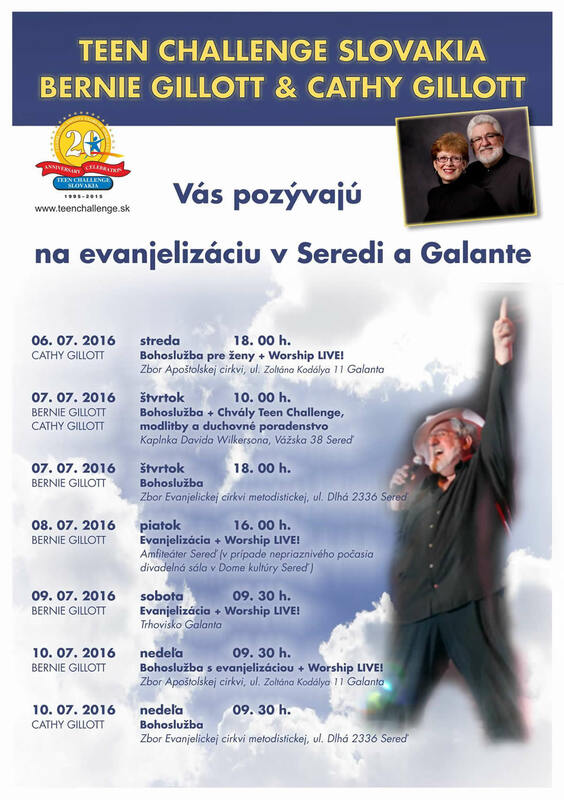 We are very excited as we prepare for our upcoming outreach in Slovakia. Working with Teen Challenge Slovakia and the local community, we are believing God to plant good seed, not only for the cities of Sala, Galanta Sered, and surrounding areas but the continuing work of Teen Challenge. Please pray for our guards. While we trust the Lord for protection, security was very important during Ramadan in the communities where we were working and these men served us honorably. Many of them experienced Christ while they were with us on outreach. May God touch them, protect them and protect their families. As the virus continues to take center stage on the world stage with the Olympics approaching, pray for our Teen Challenge students and protection for Global Teen Challenge and other missionaries that are traveling there to minister over these upcoming months. Please pray for Duane Henders, the Global Teen Challenge Latin American Director and Norbert Schenhals as they continue their powerful work there. On June 20-23 at Lighthouse Worship Center in Hayes, Virginia there will be a special Harvest Training and Partnership Conference with Howard Foltz. 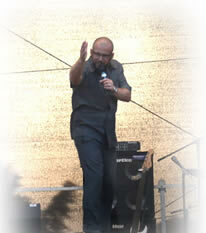 Howard Foltz, the founder of Europe Teen Challenge, is a dear friend, a valued partner and an anointed teacher. We will not be able to attend but appreciate your prayers and if you're available, we would commend this training to you and your church. 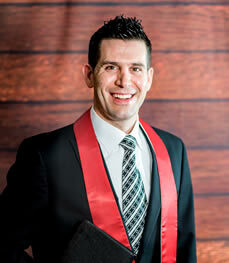 He is at the cutting edge, adopting and influencing unreached people groups around the world. If you are interested you can get details from Lighthouse Worship Center at 804-642-2752 or go to www.aims.org to register.